Since 1997, I have developed several collections. These teddies are designed by me, and produced for Happy Tymes (me) in an effort to offer a high quality, more affordable, manufactured line for you, the collector. Happy Tymes will be designated by the World Globe logo wrapped in its banner that declares, "making the world a HAPPY place, one bear at a TYME." They are produced in larger editions of 50 pieces or more. 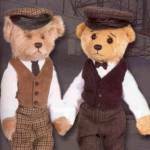 Watch for the icons to designate my homemade bears, verses the manufactured designs.